Sessions settled in Centerville, Linn County, on October 17, 1857. 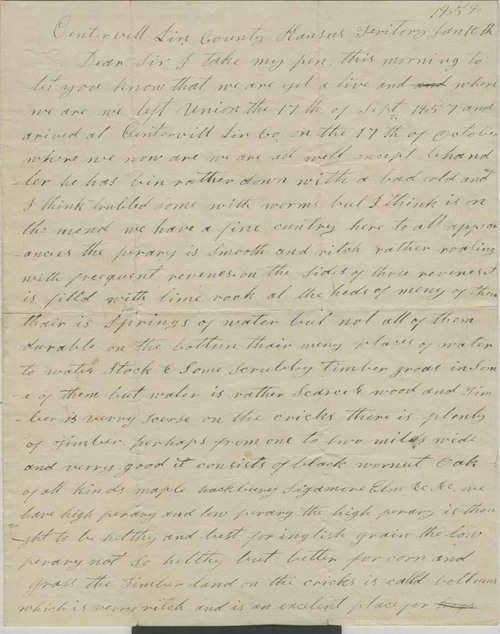 In this letter, he describes the country around Centerville, including the prairie, and the lack of timber and water except in creeks and ravines. He lists the kinds of trees found, describes the area's wildlife, and describes how those who raise hogs let them roam freely to feed as they are able. Moses C. Sessions to "Dear Sir"